Nothing brings interior designers more joy than sharing before and after pictures from a recently completed project. It is our chance to revisit how we truly changed a space for the better. I wanted to take this one step further and provide a little insight into why we made certain changes. The project is one that JBi completed in Wenatchee, WA. When the couple approached JBi, they wanted to create an elegant, traditional kitchen that also felt new and fresh. Let's call this an updated traditional look. The design plan was simple, improve the overall flow of the space, change the configuration to allow for a better entertaining space while maintaining a family-friendly feeling, and create a kitchen that was fitting of the custom nature of the home. 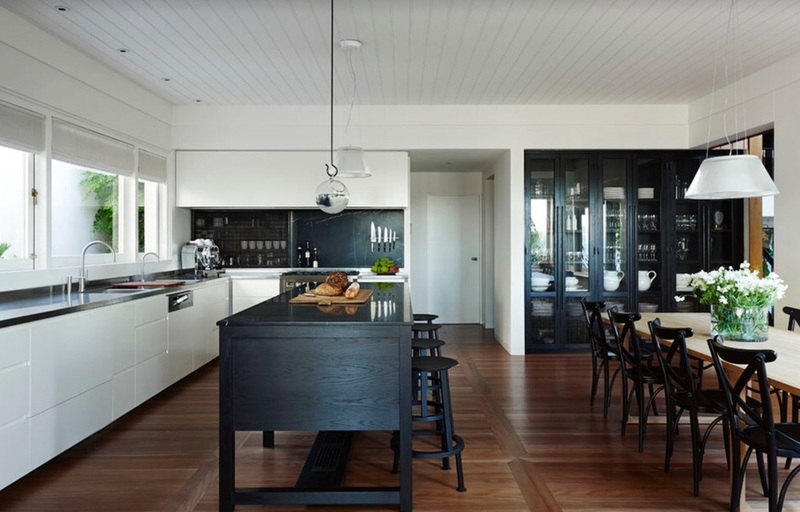 So, the JBi team set out create a space that was custom, clean and fresh, yet still a sophisticated kitchen. The big changes in the room - streamline the wall planes (get rid of that weird angled wall by the refrigerator location), create a centerpiece range hood, set up the island for large groups and make the entire space feel family friendly. A set of tall orders, but I think once you see the final result, you'll agree that all criteria were met. BEFORE: Lots of angles, cooktop oddly placed in island and angled wall that makes the kitchen feel smaller than it really is. What you'll notice first off is how we amped up the elegance level in the space. Curved mullions in the upper cabinets, beautifully detailed flush-inset cabinetry, a grand island with appropriately-sized turned legs and 6cm marble slab. In terms of layout, by taking out the angled wall part, we were able to incorporate the rest of the kitchen into the space. We created a separate coffee/beverage area with it's own sink. Now, some may criticize the placement of the refrigerator so far from everything. 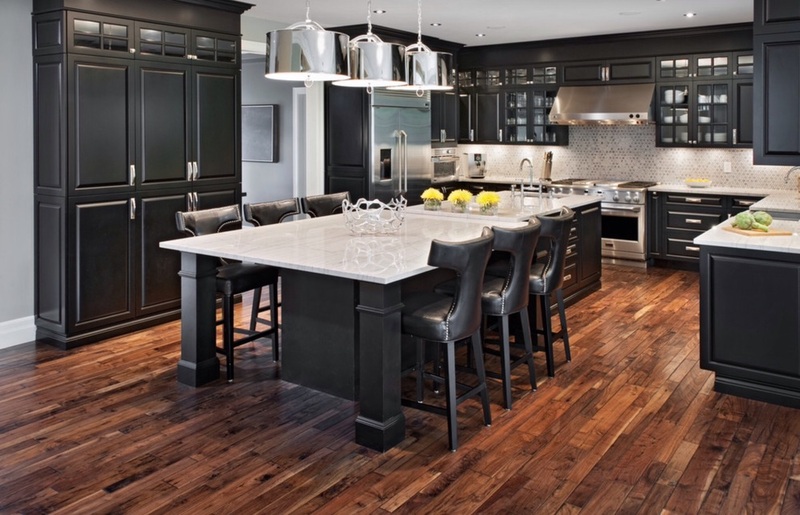 Well, as a designer of kitchens, we often have to weigh certain decisions against the function and feel of a room. In this case, we opted to place the refrigerator/freezer outside of the "first view" when someone walks into the kitchen. It also allowed us to have a dramatic range/cooktop centerpiece (we also had a perfect wall through which we could run the range hood vent pipe). So, while not optimal, the benefits we gained definitely outweighed the negatives. Looking back across the reverse angle, you can see how this kitchen is all about the view out the (truly) picture windows. With a view of mountains and the Columbia River valley, we moved the sink over to look out the best view. That left an expanse of counter top to the right of the range - perfect for cooking prep work. I'm curious to know, could you live in this kitchen? I know that I certainly wouldn't mind having such a large room in which to create perfect meals for family and friends. Here's to dreaming, right?! I know the idea of family photo walls has been around for a long time, but I think it's time I put my own spin on it. A family photo wall is a wonderful way to display pictures of family, those are still with us and those who are not. As an adult I was give a umber of historical photographs of a part of the family with whom I had lost touch. To hear the stories and see pictures of relatives helps me understand my personal history and that's a good thing. 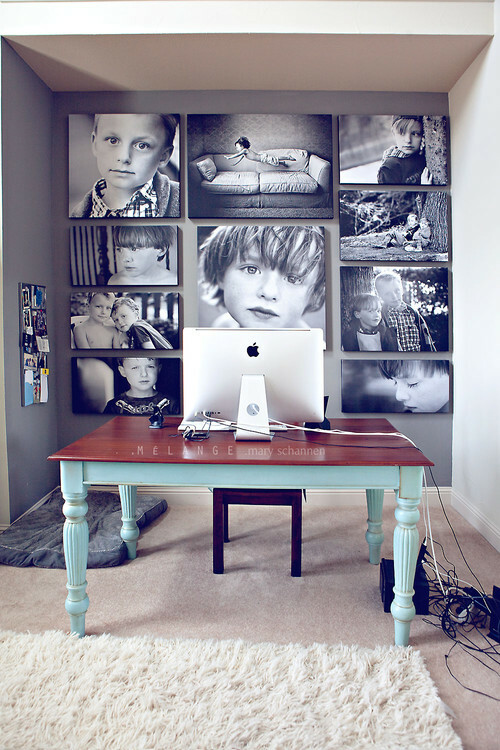 If you want to undertake creating your own family wall, here are some tips on arrangement you might consider to really make it a great design element. Make it a "living" wall. I love the idea of making an entire wall all about celebrating family. The architect of the project below creating a metal wall in along the stairs to use as a large magnet board. 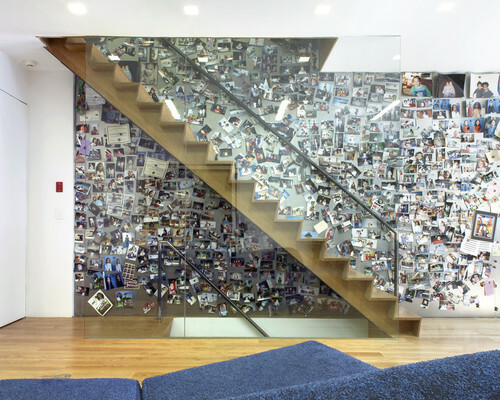 The beauty of this idea is the ability for the wall of photos to constantly change with the addition of new memories. And just think of all the nail holes NOT in the wall! This same idea can be easily be implement with clothes pins and rope for a more Bohemian feel. Grid for a modern look. As a lover of contemporary design, this one appeals to me the most. A collection of photos, different colors and shapes, all framed in the same size and style of frame. Laid out in a perfect grid pattern makes a real statement of order. The variation comes in the form of the different occasions and memories represented in the photos. Following the stairs. 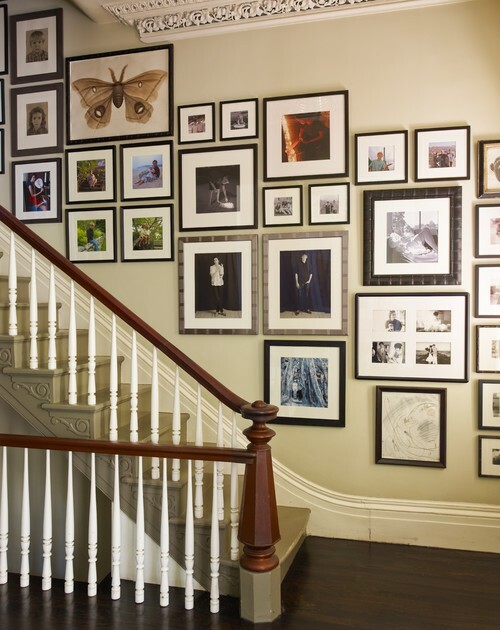 In a more traditional setting, a family gallery wall is perfect in the stairwell (assuming you have a long wall in your stairwell). Make sure to do some serious planning in the layout though just to make sure you get it right the first time. Go for the art gallery feel. Some of the earliest art were representations of people (think cavemen painting). So why not create an art gallery made up of your loved ones. These two examples so two different approaches. First is a selection of black and white photos printed on canvas and arranged in a tight collection in an office. 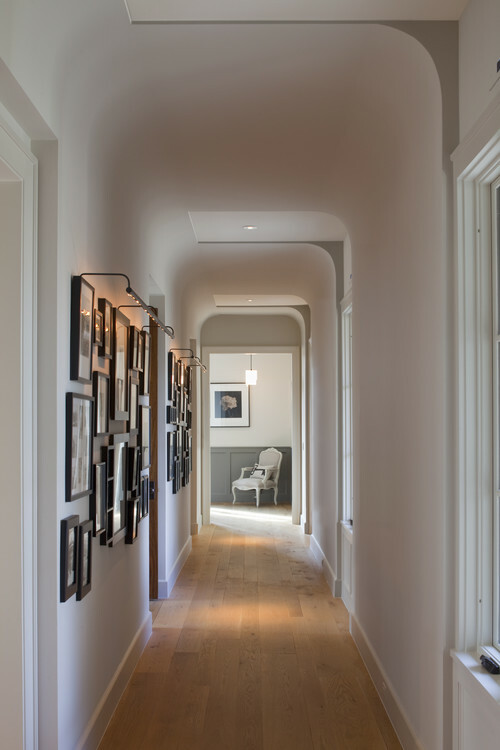 Second is a hallway gallery with appropriate lighting, providing passers by a moment to reflect on family memories. Both turn simple pictures into art. Now for your tip of the day! There's a very simple way to get your arrangement just right the first time (I learned this from a book on art arrangement). Trace and cut out the shapes of all the pictures you want to use in your family wall on either butcher paper or freezer paper (both are good alternatives). Mark on each the location of where you would place the nail. Then start taping the pieces of paper on the wall in your desired layout using painter's tape. Once you get the layout perfect, come back with a hammer and nail to mark the locations of the hanging hardware. 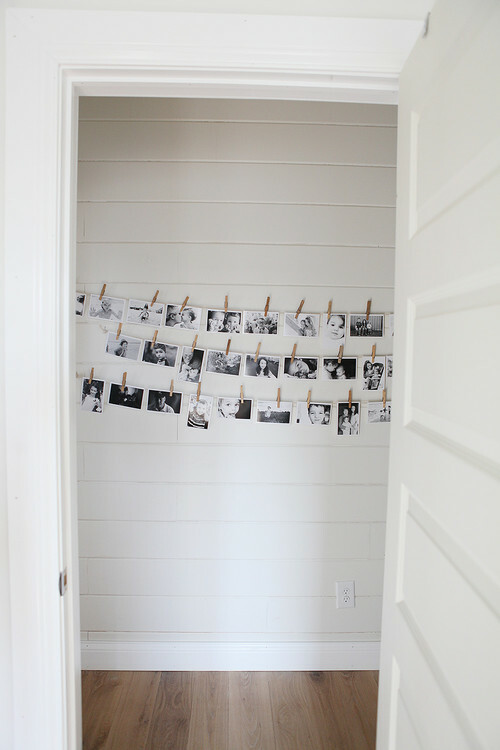 Hang up all your photos and look back at your beautiful wall. Here's to family!